In my early days of spider-watching, I derived considerable enjoyment from repeating 'experiments' and observations recorded in The World of Spiders (1958) by the great W. S. Bristowe. Recently, I have noticed several references citing Bristowe's observation of a male Xysticus cristatus (Clerck, 1757) apparently 'tying down' the female during courtship. This seems well established in the literature as fact yet, on this occasion, Bristowe's conclusions are a little less certain than usual. He alludes to forming '. . . an exciting suspicion. Surely he [the male] was tying her to the ground with silk threads!' Bristowe called it a 'bridal veil', but did not unequivocally confirm that the female is tied down, though he mentioned that he had 'watched her disentangle her legs from the protective veil with difficulty'. I drew slightly different conclusions from my own observations. 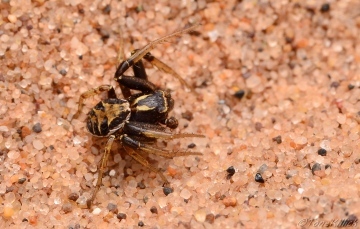 I placed a male and a female Xysticus cristatus in a petri-dish arena with a leaf-litter substrate and carefully noted the sequence of events that followed. These 'trials' were carried out on ten occasions, using a different set of partners each time. Behaviour was the same each time under these artificial conditions; I have yet to observe this under natural circumstances. The male approached the female and, after some preliminary leg waving and stretching, climbed onto her dorsal abdomen. He then walked in circles on her, laying down silk strands as he proceededâ€”Bristowe's 'bridal veil'. The female was certainly not tied down on the substrate, nor was she really restrained to any extentâ€” on some occasions the female moved her legs to allow the male to move under her and place his palp in her epigyne. They stayed in the mating position for as little as five minutes or as long as fifty-five. Soon after the male moved away, the female also moved off, easily discarding her 'bridal veil' and under no apparent restraint. My conclusion is that there is a 'token' tying down of the female, but that she is free to leave at any time she wishes. A further minor observation: females appeared to be unresponsive to the same, or another, male's advances immediately after copulation; I did not test how long this reluctance lasted. It should be remembered that the above observations were made under artificial conditions and that I did not know the sexual status (virgin or previously mated) of the participants. Nevertheless, I would be very interested to hear other readers' observations on this subject.